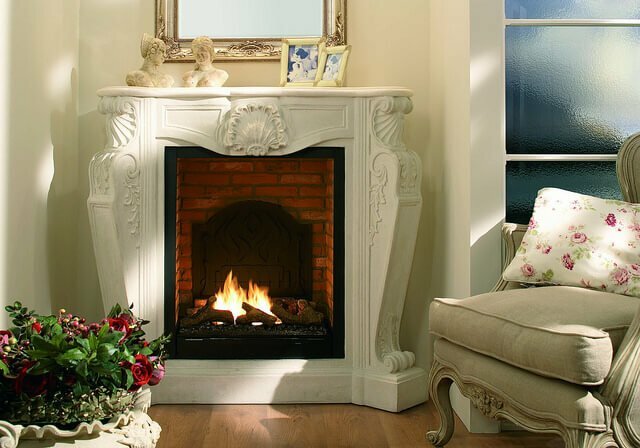 The concept of fireplaces was originally introduced with the sole purpose of keeping a home warm. But as time progressed, today, a fireplace can serve as the focal point of your house. 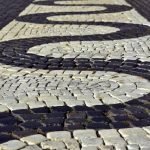 It can be installed as a decorative element to enhance the interior design of your living room or as a space to display artistic collectibles. Indeed, there are innumerable living room ideas with fireplace which lend symmetry to the entire area. Scroll through the tips below to gather inspiration on how to heat up your living area with these innovative, beautiful fireplaces. Natural stone pavers of the patio flooring beautifully complement the rock construction in this in-built luxurious outdoor living room fireplace. If you have a huge external space for your living room, the above idea is ideal to snuggle up on a chilly winter evening. It comes with cabinets on each side to store additional items. The tops of the cabinets offer ample space to place and showcase decorative pieces. 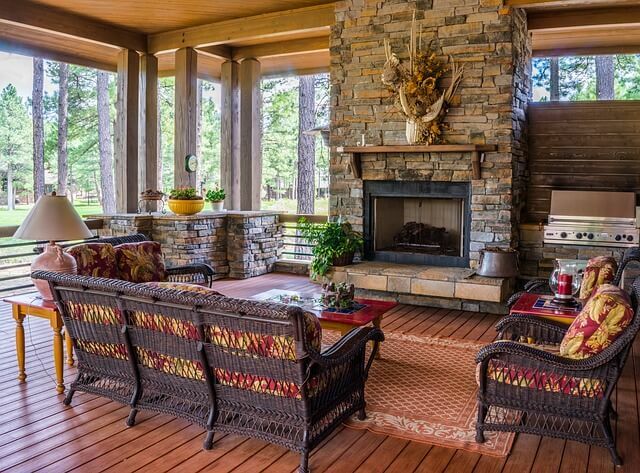 Arrange a seating area around the fireplace and enjoy the cozy feel of a crackling, warm fire. One of our favorite antique living room ideas with fireplace, this layout features a rustic brick fireplace that sets a warm tone in the surrounding area. Note how the vintage artifacts (with a few books) — placed above the mantel — give a cohesive look to the room. An antique clock at the middle of the wall and an iron sofa on one side perfectly balance the setup. Plush chairs on the opposite end with a center table in between add that required modern touch to the living room. 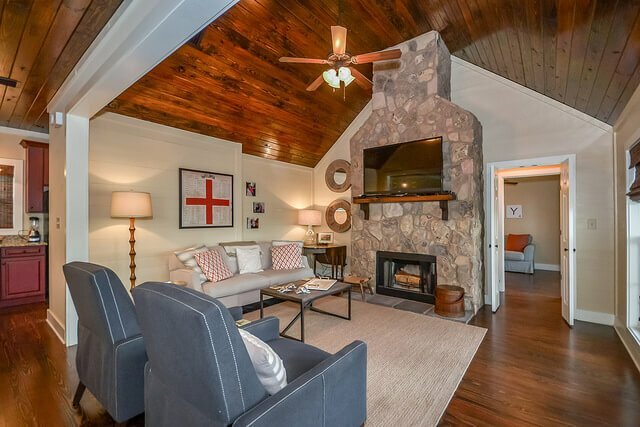 This traditional log-burning brick fireplace — embedded within a white mantel — artistically incorporates natural textures. Artistic collectibles — echoing historical character — placed at the top seamlessly blend with pops of colors from flowers in white vases and colorful throw pillows on the adjacent sofa. 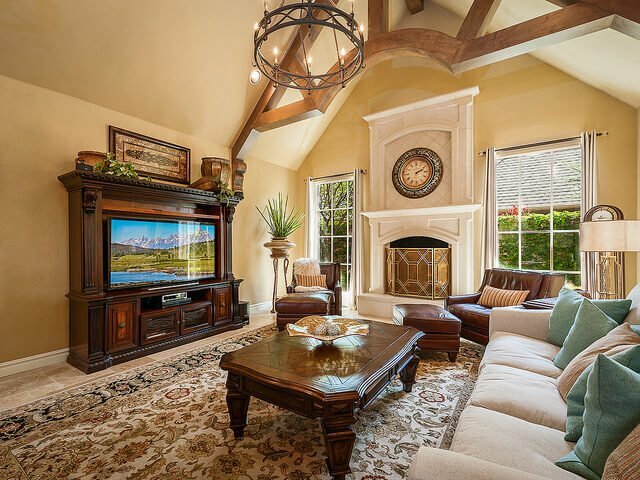 This massive living room, designed with a stunning cast stone fireplace, sets a dramatic tone when combined with the vaulted ceiling – lined with timber and a huge antique wall clock over the mantel. The travertine flooring lends the entire space a welcoming look — complemented with dark, sturdy, and polished wooden furniture such as the TV stand and center table. Plush sofas in woody and neutral shades make this one of our most extravagant living room ideas with fireplace. 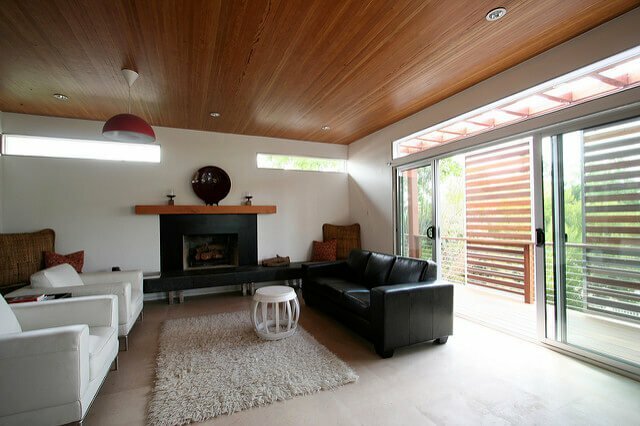 A living room fireplace that is simple and yet not boring, this modern layout exudes sophistication in all aspects. Featuring sharp edges and neutral shades, the complete design is such that each side is the reflection of the other. 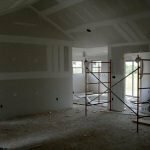 If you are a fan of minimalist decor, this is the idea for you! This high-ceiling living room features a stone facade fireplace — all the way up — that also houses a space to fix a TV stand. The natural, rustic texture of stones and chic, polished wooden flooring lend warmth and character to this minimalist setup. When designing fireplaces, don’t be afraid to experiment with darker shades as well. Check the above idea. A vaulted recycled-wood ceiling complements the dark hue of the fireplace mantel. The wall surrounding it has clerestory windows for allowing in daylight, without hindering your privacy. The fireplace surround is made from powdered steel and also features a recycled beam It is mounted over an inbuilt slate bench seat that runs through the entire length of the fireplace wall. Sliding doors at the edge of the living room offer a view of the sun shades fixed on the side of the deck — giving ample scope for illumination with natural sunlight. 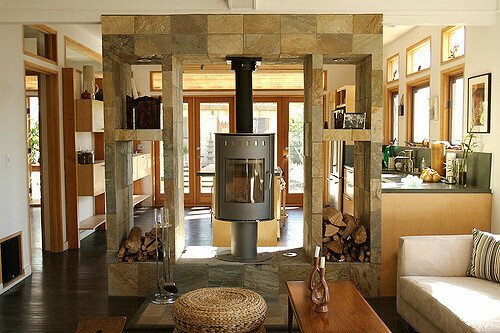 This is indeed one of the most unique living room ideas with fireplace that we came across. The entire house, as well as the living area, has long vistas that generate a layered interior — allowing ample airflow and light. Its central focal point is the wood-burning rotating fireplace that lends an aesthetic appeal to the setup. This stone fireplace surround is made with Cantera stone (a solid rock variant which is similar to cast stone) is set over ceramic tiled flooring made from faux wood. 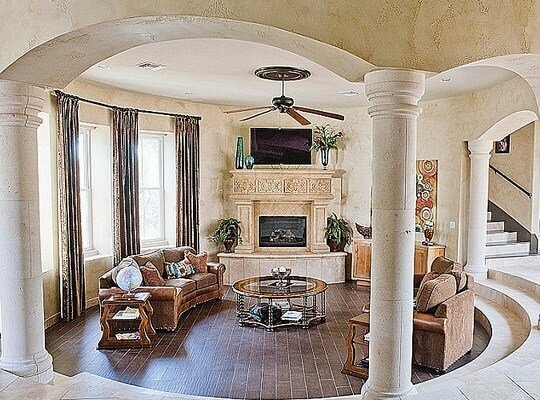 Matching wooden furniture and stone pillars give a cozy yet outdoorsy ambiance to the entire family room. Bring the feeling of the wilderness with this ranch-inspired fireplace. 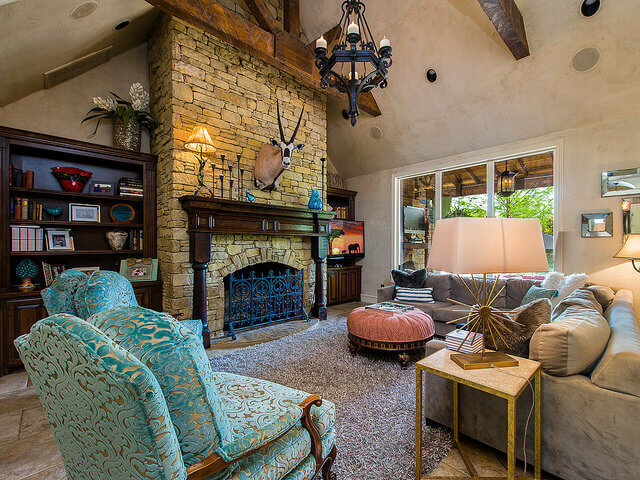 The grand living room features a cathedral ceiling with wood beams and a limestone fireplace. The inbuilt antlers, a suspended chandelier, and ornate collectibles surely up the rustic feel of this spacious room. If you thought fireplace enclosures always need to be traditional, then let’s prove you wrong. 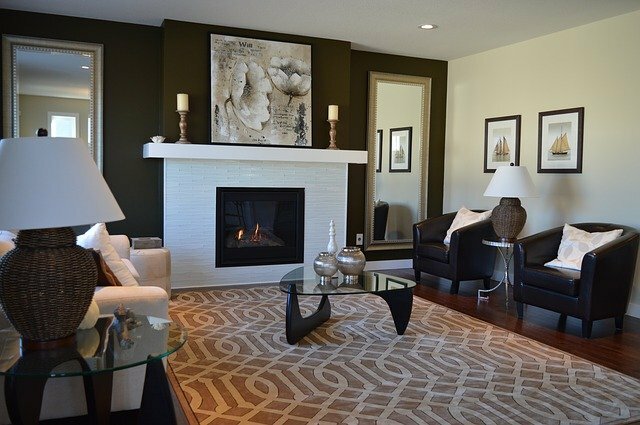 Check out this arrangement that’s easily another of our chosen living room ideas with fireplace. This contemporary piece comes with a see-through glass enclosure that’s contrasted against a white surround wall. The setup is completely modern and unique. Stone and wood are a classic combination that goes well with almost any kind of arrangement. In this living room, check how the stone fireplace — blended with woody accents — beautifully creates a quintessential ranch or farmhouse style look. Warm, cozy, and inviting, it comes will enough vertical windows to let in ample sunlight. 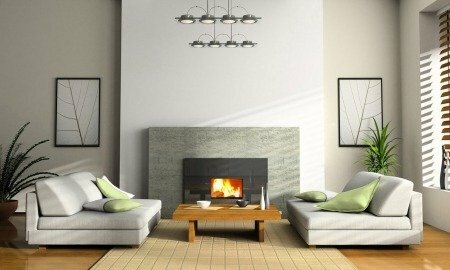 Winter is already here and these cozy, classy living room ideas with fireplace shall inspire you to implement some tips in your next living room remodel project. Each of the above suggestions has been put out in front of you so that you can transform your living space into total winter goals. Come on, get started!